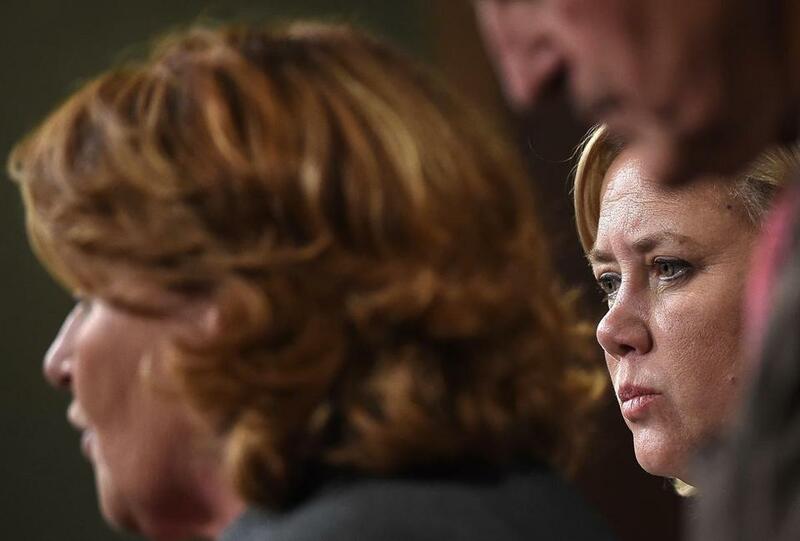 Senator Mary Landrieu waits to speak after the Senate voted on the Keystone Pipeline bill Tuesday. In the brutal closing scene of the 2007 film “There Will Be Blood,” a bowling alley beating, set in motion by years of tension and personal torment, concludes with the final biting words, “I’m finished.” Sifting through the wreckage on the Senate floor last week, the same words could have come from Louisiana’s Mary Landrieu. Forty-one of her Democrat colleagues ruthlessly beat down her proposal to approve the Keystone pipeline, effectively sealing her fate in the December runoff election to keep her seat. Keeping a brave face, Landrieu insisted she held no one to blame and only felt “joy in the fight.” But as anyone who saw Daniel Day Lewis’s dark performance will attest, some fights contain far less joy than others. Perhaps the battle over Keystone would have been more fun had Majority Leader Harry Reid allowed it to take place a few months ago when it might have mattered. As it is, Landrieu will be remembered for her failure; her colleagues for their lack of remorse. Landrieu herself raised the stakes by engaging in the fight during the lame duck session, then boldly predicting she had the 60 votes needed to prevail. If there is any lesson members should learn early, it’s how to count votes — and not to share the tallies with anyone, especially the media. Why give information to your opponents, particularly when that opponent is your own leadership? Leadership rarely loses the close ones. When they know whose arm to twist, you’ve handed them the path to victory. It didn’t help matters that Democrats still don’t know what the Keystone debate is really all about. For the moment, most remain wed to the idea that it is central to the future of global climate change. On substance, that’s a pretty silly argument. The Canadians already produce 2 million barrels a day from Alberta’s oil sands, transported through existing pipelines and over rail. New pipelines to the West Coast are in the works. Keystone would provide another economic alternative, but have limited impact on long-term extraction rates. Politically, the climate card loses as well. Billionaire Tom Steyer generously proved this by spending $74 million in vain trying to influence key Congressional races. Voters either refused to buy his over-the-top doomsday rhetoric, or simply didn’t place a high priority on the issue. It didn’t help the climate champions that the Keystone debate took place as five feet of early November snow fell across the Great Lakes and upstate New York. “It doesn’t have an impact on US gas prices,” he insisted. Unfortunately, he’s wrong. For starters, the pipeline will carry oil from North Dakota — not exactly Obama country, but America nonetheless. Second, crude oil prices are set on a global basis. Whether the oil reaches port at Vancouver or Houston, the contribution to global supply helps establish the market price. By trying to dismiss the economics of the pipeline, Obama revealed his ignorance about economics. Ultimately, this is a debate about infrastructure, regulation, and the power of government to thwart investment on the flimsiest of grounds. Keystone has met local, state, and federal permitting requirements. It places no government money at risk (hello, Solyndra), and both the Energy and State departments’ assessments describe its significant economic benefits. And yes, the public overwhelmingly supports completing the project. More important, however, the public understands that allowing the government to arbitrarily stand in front of private investment and economic development sets a dangerous precedent — something Democrats in the Senate do not. There, the beatings are administered with words and votes, not bowling pins, but the results can be just as harsh. Closing debate on the Senate floor, California’s Barbara Boxer spoke for over a half-hour condemning the pipeline and all it stood for then called Landrieu a “great senator.” Maybe so, but not for long.